Boyden, Matthew; Buckley, Jonathan (1994). Classical Music on CD-The Rough Guide. London: Rough Guides. ISBN 1-85828-113-X. d'Indy, Vincent (1910). César Franck; a Translation from the French of Vincent d'Indy: with an Introduction by Rosa Newmarch. London: John Lane, Bodley Head. Reprinted 1965 NY: Dover. ISBN 0-486-21317-X. Davies, Laurence (1970). César Franck and His Circle. Boston: Houghton Mifflin. Davis, Elizabeth (ed.) (1997). A Basic Music Library- Essential Scores and Sound Recordings. Chicago: American Library Association. ISBN 0-8389-3461-7. "Franck, César." Norton/Grove Concise Encyclopedia of Music. (Pub. in UK as Grove Concise Dictionary of Music.). New York: Norton, 1988. Ober, William B. (1970). "De Mortibus Musicorum: Some cases drawn from a pathologist's notebook." Stereo Review, vol. 25 no. 5 (November 1970). Smith, Rollin (1997). Playing the Organ Works of César Franck. Series: The Complete Organ No. 1. Hillsdale, NY: Pendragon Press ISBN 0-945193-79-3. ——— (2002). Toward an Authentic Interpretation of the Organ Works of César Franck. Second edition, revised and expanded. Series: The Complete Organ No. 6; Juilliard Performance Guide No. 1. Hillsdale, NY: Pendragon Press. ISBN 978-1-57647-076-3. Stove, R. J. (2012). César Franck: His Life and Times. Lanham, Maryland: Scarecrow Press. ISBN 978-0-8108-8207-2. 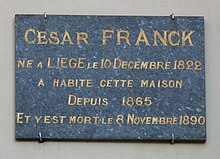 "Franck, César" . Encyclopædia Britannica (in English) (11th ed.). 1911.